In the 1930s, chlorine gas became commercially available and applications around the world began to take advantage of it as a disinfectant. Today, chlorine is the most widely used disinfectant in water and wastewater treatment processes. Growing concern over the past few decades about the health and safety of chlorine, especially in its gaseous state, has many plants considering alternatives. When designing and building industrial systems, including pipes, fittings, valves and tanks, steel is one of the most widely utilized materials. Stainless steel and carbon steel are two common forms that have been used for processing applications for decades. But as political and economic uncertainties compound, the price and supply of commodities like steel becomes more volatile. As of August 2018, the price of steel was 44.2% higher than during the same period last year. After five years of mostly consistent price drops for stainless steel, the recent jump is cause for concern for industrial plants. For vessels storing hundreds or thousands of gallons of corrosive chemicals, safety is a critical component. To ensure an installed vessel will store chemicals safely, tank design must be based on a documented procedure known as a process safety management (PSM) program. The Occupational Safety and Health Administration (OSHA) outlines general procedures required for PSM programs, which are adopted and adjusted by each plant. The OSHA 1910.119 Process Safety Management of Highly Hazardous Chemicals contains “requirements for preventing or minimizing the consequences of catastrophic releases of toxic, reactive, flammable, or explosive chemicals. These releases may result in toxic, fire or explosion hazards.” The section for mechanical integrity states, “equipment used to process, store, or handle highly hazardous chemicals needs to be designed, constructed, installed and maintained to minimize the risk of releases of such chemicals.” As a result, make important safety steps and considerations in accordance with the PSM program, which ensures all hazards are assessed and addressed in the final vessel. ASTM F441 is the Standard Specification for CPVC Plastic Pipe, Schedules 40 and 80. Per the standard’s requirements and test methods, CPVC is assessed for “materials, workmanship, dimensions, sustained pressure, burst pressure, flattening and extrusion quality.” Another set of CPVC standards is defined by ASTM D1784. This specification assesses CPVC according to “base resin, impact resistance under notch, tensile strength, modulus of elasticity in tension, deflection temperature under load and flammability.” By specifying CPVC that meets ASTM F441 and ASTM D1784, users should have confidence that their industrial piping systems will perform as expected. Yet, not all approved CPVC is created equal. Within each standard are distinctions that set certain CPVC compound producers and manufacturers apart. When deliberating between material choices and general industrial piping system design, the primary considerations revolve around pipes and fittings. Specifically, the focus is typically on the pipe and fitting materials’ temperature, pressure and compatibility characteristics. Valve selection is often an afterthought finally considered once those primary decisions are settled. But valve decisions are vast: types include ball valves, gate valves, globe valves, butterfly or wafer valves, check valves, diaphragm valves and more. The number of valves can vary greatly in a system depending on the purpose of the piping system. However, valves are critical to any successful system due to their importance in controlling the flow. Also, because a system is only as strong as its weakest component or joint, valves deserve much greater attention when considering material options. Why Use CPVC in Wastewater Treatment Plants? The following is an excerpt from “CPVC Use in Wastewater Treatment Plants.” Download the full ebook to learn more about where CPVC can be installed in wastewater treatment plants, which chemicals CPVC stands up against and how CPVC compares to alternatives in various applications. Wastewater treatment plants are extremely corrosive environments. During the treatment process, large vessels and piping systems convey polluted water and highly corrosive and caustic chemicals. To keep wastewater treatment plants efficient and cost-effective, appropriate material selection is critical. Corrosion to pipes, valves and fittings caused by chemicals and microbes can greatly impact the bottom line at water and wastewater treatment plants. As a result, engineers and procurement officials turn to an economical, reliable material—chlorinated polyvinyl chloride (CPVC). In an industrial system, and in any piping system, valves are used to restrict, stop or control the flow of fluid. More specifically, some industrial valves are used to: Control the cooling rates of water through cooling lines to regulate the temperature. Manage the flow of concentrated acids or bases flowing through a line. Redirect flow from one line to another at a three-way valve. Restrict flow for system balancing. Prevent reverse flow (check valves). Automatically stop the flow in the event of a system failure. When considering available valves for an industrial system, evaluation depends on both the short term and long term performance of a valve. And depending on the application, one valve may outperform another and provide a superior service life. Mitigating corrosion is a frequent topic of Corzan® Industrial Systems educational resources, and for good reason. Many industrial applications still use materials that are not compatible with their process out of habit and comfort, leading to corrosion, costly repairs, and system downtime. These results all create significant material, installation and opportunity costs. To mitigate these issues, Corzan Industrial Systems introduces corrosion resistant materials where applicable to increase the safety, efficiency and reliability of industrial plants. With chemical resistance to over 400 chemicals, Corzan CPVC pipes and fittings have been solving compatibility issues for over 60 years. The latest development in that effort is Corzan Industrial Systems’ growing partnership with NACE International. You have likely heard it before—more than 70% of the earth is covered by water. However, in terms of potentially consumable water, freshwater only makes up 2.5% of total global water. And 68.7% of all freshwater is bound up in glaciers and ice caps. Put simply, most of the earth’s natural water cannot be easily consumed to sustain life. And with the global population increasing an estimated 83 million people per year, efficient methods for creating safe drinking water must be increasingly adopted. The greatest opportunity for new freshwater is to utilize easily available seawater and convert it to usable drinking water. Desalination is the process used to remove salt from saline water to create potable water. To create a dependable desalination system that will handle its unique demands, specific considerations must be made for the piping material selection. Contrary to what some may assume, Corzan® Industrial Systems does not produce the final CPVC products used in industrial plants around the globe. Rather, we engineer and manufacture CPVC compound from PVC resin, as the chart depicts below. The Corzan CPVC compound that is shipped to partner manufacturers in pellet or powder form has been fortified with additives to provide superior strength, UV resistance and improved processability for manufacturers. Our propriety CPVC compound also offers inherent resistance to corrosion, high temperatures and high pressures no matter what final form it takes. Our partner manufacturers transform Corzan CPVC pellets and powder into the piping, fittings, sheet, shapes and other CPVC products end users receive. This process begs the question from potential customers: How does Corzan Industrial Systems ensure each product offers consistent quality regardless of when, where or by whom the product is manufactured? Minimizing energy costs is one of the main areas of opportunity for plant owners looking to increase their bottom-line. At a macro level, according to the U.S. Energy Information Administration (EIA), the industrial sector uses more energy than any other sector, consuming about 54% of the world’s total delivered energy. Engineers are always looking for ways to optimize system processes to improve energy efficiency to decrease energy expenses. Proper piping material selection is one opportunity to limit energy consumption. Take a look at how CPVC piping compares to metal piping in terms of energy efficiency across a system’s lifecycle, even before the pipe is installed. How Well Do Metals and Plastics Stand Up to Salts, Brine or Seawater? When employing salts, brine or other saltwater solutions in industrial processes, the plant’s decision of which piping material greatly impacts lifecycle costs. Some may see corrosion as a necessary evil when dealing with salts, but proper material selection limits unnecessary repairs, downtime and cost. Over the course of years or decades, this can result in millions of dollars saved in direct expenses and opportunity costs caused by downtime. Food, pharmaceutical, chemical and paper industries often use vessels for processing corrosive and caustic substances. Traditionally, these vessels are composed of steel, fiberglass or exotic alloys. Because chemical corrosion often deteriorates metals over time, the need for a more compatible and long-lasting vessel material is apparent. The solution? Dual laminate vessels. Dual laminate vessels are hybrid chemical storage systems made up of a thermoplastic liner and a fiber reinforced plastic (FRP) shell. The FRP component provides mechanical strength to the vessel, while the thermoplastic liner increases the chemical resistance of the inside, preventing corrosion. Thermoplastics allow dual laminate vessels to withstand the effects of highly corrosive chemicals at high temperatures. These chemicals may include: Sodium hypochlorite Hydrochloric acid Cell liquor (brine, sodium hydroxide) Sodium Chloride Sodium hydroxide Demineralized, deoxidized water The inherent chemical resistant properties of thermoplastics, like CPVC, result in longer-lasting containers. This material choice directly reduces the downtime required for repairs and can limit replacements. However, dual laminate vessels must be designed and fabricated specifically for each plant’s applications and needs. Below, we explain how dual laminate vessels are manufactured to withstand the effects of these highly corrosive substances, and the main phases that must be carefully considered. We often receive questions from industrial engineers about CPVC products—including, what goes into creating CPVC, why is it better than other materials, and ultimately, where can CPVC products be purchased? In the engineering and production of industrial CPVC, each step is critical—from raw material to PVC, PVC to CPVC, and CPVC to finished product. The highest quality CPVC products available outperform generic alternatives as a result of innovation and quality control from start to finish. As the saying goes, “a chain is only as strong as its weakest link.” With an industrial system, the same rule applies. Though welding rod material accounts for a seemingly insignificant fraction of a system, if it fails—whether from corrosion, pressure or temperature demands—the whole system is affected. Due to chlorinated polyvinyl chloride’s (CPVC) inherent chemical resistance and overall performance, CPVC sheet is often fabricated for different industrial uses. Whether the CPVC sheet is fabricated to be the tank lining in an air scrubber, for a storage tank built entirely out of CPVC sheet, or for a specialty fitting, the welded seams must maintain the strength and reliability of the CPVC material. In each case, correct welding rod selection and effective welding techniques directly correlate to how long the system will last before requiring repair. One of the benefits of working with chlorinated polyvinyl chloride (CPVC) pipe is that it can be cut with a variety of different tools that don’t require any electricity or heat. However, different cutting methods are preferred over others, depending on the application. When cutting CPVC pipe, it is important to make a square, flat cut. An uneven cut limits the bonding area and weakens the fitting. To help you make the best possible cut, we’ve put together the following dos and don’ts when cutting CPVC pipe in different situations. In industrial applications with harmful particulate and pollutive byproducts, air scrubbers are often used to meet emissions standards. A scrubber is a system that cleans or purifies air by removing gasses, particulates, or otherwise harmful compounds from a system’s emissions. There are many kinds of scrubbers available and their specific functions depend on the compound being removed from the processed stream. For example, power systems require scrubbers along with combustion vents to remove particulates from the generator or boiler. In any scrubber that handles corrosive compounds, CPVC is a viable choice for tank lining, drain piping, and more. Wet scrubbers in particular, which use continuous sprays of neutralizing fluids to control harmful emissions, benefit from the chemical compatibility of CPVC to improve the performance and overall lifespan of the scrubber. When highly corrosive chemicals are used in industrial processing applications, chlorinated polyvinyl chloride (CPVC) is often specified. 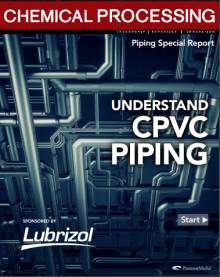 Depending on the unique system conditions and applications, different CPVC piping variations—such as schedule 80 piping, schedule 40 piping, or even CPVC-lined FRP—may be recommended. Use this guide to learn about the general differences between the three options to help determine the CPVC type that is ideal for your application. Hot air welding is a joining method that uses high heat to make chlorinated polyvinyl chloride (CPVC) material reach its melt state. Pushed together for a certain amount of time at a specific pressure, this method allows the surface molecules of the two pieces to interlock, fusing them together. Hot air welding is an essential technique for CPVC sheet fabrication and can also be used to join pipes and other geometries when other joining methods are not an option. There are a few available methods for joining CPVC pipes and fittings, but solvent welding is often recommended as the optimal solution because of the strong, reliable bond it forms between adjoining pieces of material. Solvent cement isn’t glue­—rather, it’s a chemical compound that untangles the surface molecules of CPVC material, freeing them to bond with those of another CPVC piece. The result is a fully fused joint that maintains the chemical resistance, temperature and pressure bearing capabilities of the original material. To reach optimal joint strength, the solvent cement must adequately soften the surface material, and enough time must be allowed for setting and curing. Curing is when the solvent flashes off or evaporates, allowing the newly formed joint to dry and harden. In cold weather applications, solvent cement and CPVC molecules slow down, requiring more solvent to soften the material and more time to cure or harden the joint. Conversely, in hot environments, the molecules speed up, creating different potential challenges for installers. By following a few simple guidelines, reliable CPVC joints can be solvent welded at temperatures exceeding 95°F (35°C). Acids are commonly used by industrial plants for a range of applications, from pH adjustment to the manufacture of other important industrial chemicals. Some of the most common acids include: sulfuric, nitric, hydrochloric and phosphoric. These acids are aggressive substances that can be highly corrosive to certain materials. Metals tend to corrode quickly when exposed to acids relative to some thermoplastics. In addition, the high pressure and heat of many industrial processes tend to escalate this corrosion. In the case of high-quality CPVC, the high level of chlorine in the polymer chain helps protect it from the degrading effects of acids. That said, material degradation and corrosion can occur over time. The severity is largely based on material quality and operating temperature, as well as acid concentration and type. Because of the corrosiveness of mineral acids, special considerations must be made when transferring and storing them in an industrial facility. “Glue” and “solvent cement” are two words often used interchangeably in reference to plastic piping installation. On a basic level, both accomplish the immediate goal of joining. However, the substances are very different in how they work and their respective performance. While glue is an adhesive that connects or “sticks” two pieces together, solvent cement fuses the two pieces together at the molecular level, essentially establishing one uniform piece of material. This fundamental distinction is just the beginning of the differences between the two joining materials. What Construction Products Are Chemically Compatible with Corzan® CPVC? Throughout the construction process, a number of the products used—such as thread sealants, gaskets and insulation—might come into contact with piping system components. Each of these products includes its own unique chemical makeup that enables it to serve a specific function within the larger system. For example, gaskets combine polymers and lubricants to form a tight, long-lasting seal between flange fittings. The challenge for engineers is certain chemicals, when in contact with a piping material (e.g. steel or CPVC), can weaken the material and cause premature failure. In other words, to ensure the longest life for your piping system, it’s important to select ancillary products that offer the greatest compatibility with your piping material. Read the full post below or check out the Thermal Expansion Infographic for a snapshot overview of this blog post. All material has inherent thermal properties that affect its characteristics depending on the amount of heat or cold it’s exposed to. The more heat is applied, the more materials tend to expand and soften. The colder the conditions, the more materials tend to contract and harden. In the case of piping systems, we are most concerned with linear expansion and contraction, which affects both metallic and thermoplastic piping materials. If unaccounted for during the piping system design, length fluctuation can lead to costly issues. This is especially true for industrial plant systems, which often subject pipe to extreme temperatures and pressures. For example, if a run of pipe is constrained at both ends, as it heats up linear expansion will cause compressive stress on the material. When this undue force exceeds the allowable stress on the material, it will result in damage to the pipe and potentially brackets, fittings, and valves. Depending on the scope of that damage, plants may be forced to conduct frequent repairs, shut down processes, and potentially replace the piping system prematurely. Fortunately, while expansion and contraction are unavoidable, resultant issues can be easily circumvented with the proper design considerations. Specifically, by employing one of the following deflection mechanisms: Expansion Loops Expansion Offsets Changes of Direction Expansion Joints Before we explain how to deploy each mechanism, we need to look at the four factors that influence their design. Thermal conductivity is an important consideration in any piping application, from both a safety and liability perspective. A piping system material with lower thermal conductivity will maintain a lower surface temperature when transporting hot fluids. In certain situations, this can reduce the risk of burns to operators who may come in contact with the pipe. This is especially pertinent for individuals working near a valve, pump, or tank inlet, where multiple piping runs exist in close proximity. According to the Bureau of Labor Statistics, instances of thermal heat burns caused a median of 6 days away from work in 2016. To achieve a comprehensive picture of CPVC’s thermal conductivity qualities, Corzan® Industrial System engineers recommend starting with a comparison of thermal conductivity ratings. Can CPVC Piping Be Used With Other Piping Materials? As CPVC becomes increasingly specified in industrial processing applications, the conversation around how it compares to other piping materials grows. Often, we are asked: How does CPVC piping compare to metal piping? What is the difference between CPVC and PVC? For this post, rather than compare and contrast CPVC’s characteristics to another material, we explore the possible joining methods and specific uses CPVC may have in conjunction with other thermoplastic or metal piping materials. In any piping system that uses flanges, gaskets are crucial. Gaskets are placed between flanged system components to create strong seals that stop leaks and provide greater reliability. As with piping material, gasket selection and installation play significant roles in the overall performance and life expectancy of a piping system. Specifically, plant maintenance personnel and engineers must consider piping system compatibility, physical properties of the gasket, and installation specifics. Corzan® Industrial Systems’ team of engineers and product specialists recommend starting your search with the fluid flowing through your system. What Is The Difference Between CPVC and PVC? Polyvinyl chloride (PVC) is a familiar and versatile thermoplastic especially known as a piping and fitting material used for residential and commercial plumbing applications. In the same thermoplastic family to PVC is chlorinated polyvinyl chloride (CPVC). CPVC, though similar to PVC in name and available product types, exhibits superior resistance to heat and pressure, which enables it to be used in more demanding industrial applications. The difference in heat and pressure resistance stem from the molecular makeup of each material. How Are CPVC Pipe Pressure Ratings Calculated? This post is an introduction to our resource article, "How CPVC Pipe Pressure Ratings Are Calculated." To be used in pressure piping systems, every material must empirically prove its pressure bearing capabilities. This ensures that plants and facilities are integrating piping that can stand up to the long-term strength demands of their applications. ASTM, ISO and the Plastics Pipe Institute Hydrostatic Stress Board have developed a series of test methodologies and design factors to verify the long-term pressure bearing capabilities of thermoplastic compounds (e.g. chlorinated polyvinyl chloride (CPVC)). This post is an excerpt from our resource article, “Metal v. CPVC Piping Systems — Can CPVC outperform metal piping in industrial applications?” For demanding industrial applications, metal piping materials, such as carbon steel or stainless steel, are the traditional choice. However, with the significant threat scaling poses to metals in industrial applications, should it continue to be? If your plant exclusively considers metal piping materials, viable alternatives are being overlooked. Chlorinated polyvinyl chloride (CPVC) piping systems present significant advantages to metal in environments prone to scaling. Learn more scaling in metal and CPVC piping systems below. What if Someone Hits Corzan CPVC with a Forklift? The original Corzan® Engineering Design manual included an appendix titled, “Things Not to Hit CPVC Piping With.” It included items like a baseball bat, passenger train and lightsaber. But, first on this list, was a forklift. Unfortunately, due to binder-size restrictions, the appendix had to be omitted. All jokes aside, the reality is accidents do happen and all piping material will sustain some degree of damage if subjected to any significant force, such as a direct, unprovoked forklift attack. But, the severity of that damage and the resultant downtime can be limited by specifying the proper piping material. This post is an excerpt from our resource article, “Metal v. CPVC Piping Systems — Can CPVC outperform metal piping in industrial applications?” For decades, metal piping systems have been the standard choice of engineers and architects in industrial applications because of its strength and durability in high heat and pressure environments. However, metal piping is not without its drawbacks. Specifically, if your plant uses stainless steel, carbon steel or another alloy to transport fluids, corrosion can be a real concern. Corrosion affects flow rates and efficiency, weakens pipes, and can lead to unexpected and costly shutdowns. Conversely, pipes and fittings made with chlorinated polyvinyl chloride (CPVC) material are strong enough to withstand the high heat and pressure of industrial processes, while also being inherently inert to most acids, bases, salts and aliphatic hydrocarbons. This means the aggressive ions that attack metal molecules flow right past CPVC, leaving them and the piping unscathed. Let’s take a look at how metal piping corrodes and why CPVC is an effective solution to eliminate this threat in industrial piping systems. All piping material inherently becomes more brittle in low temperatures. Because of this, we are often asked, “What is the absolute minimum temperature CPVC can be installed at?” The short answer: there is no known absolute minimum installation temperature for Corzan® CPVC. One manufacturer of industrial Corzan CPVC, IPEX, confirms that high strength joints have been made at temperatures as low as –15°F (–26°C). Oatey and Weld-On, two leading solvent cement manufacturers, assure the same. Regardless of an absolute minimum, all low temperature installations—below 40°F (4°C)—require heightened attention to detail to create a dependable piping system. For many applications, industrial piping systems are installed completely or partially outdoors, exposing them to the elements. These can include seasonal temperature changes, wind, rain, snow, salt water and direct sunlight. While thermoplastics ideally weather many of these conditions, some thermoplastics don’t stand up well to direct sunlight, or more specifically, ultraviolet (UV) radiation. After prolonged UV exposure, some thermoplastics begin to chemically breakdown, which can lead to early degradation and shorten the system’s life expectancy. And, because Corzan® CPVC is also a thermoplastic, there are often incorrect assumptions about its UV weatherability. In reality, Corzan CPVC is expertly engineered to stand up to the effects of prolonged UV exposure. Let’s take a look at how UV radiation affects thermoplastics and some CPVC piping systems. WEFTEC® is the largest annual water quality event in the world. Industry professionals from around the world gather to find the best water quality education and training available today. At this year's event, the Water Environmental Federation's Technical Exhibition and Conference (WEFTEC) will be celebrating 90 years of the event. The exhibition floor will host technology leaders at the forefront of the field, including Corzan® Industrial Systems. Stop by booth #6451, where our team of regional CPVC product and engineering specialists will be on hand to provide advice, information, and training on piping systems for water and wastewater treatment applications. Specifically, we can explain how advanced CPVC technology can increase operational efficiency, minimize downtime and improve bottom line performance. Learn more about CPVC, the pipe and fitting material more wastewater engineers are turning to. Event Details: Where: McCormick Place in Chicago, Illinois Dates: Conference: September 30 - October 4, 2017 (Exhibition: October 2 - 4, 2017) Booth: 6451 More Details: Visit www.weftec.org. Surge pressure is caused when the velocity of fluid through a piping system suddenly changes, typically by a valve opening or closing. This dramatic pressure change creates a shock wave within the pipes, which travels back through the fluid and exerts pressure on the piping walls and fittings. This additional pressure puts stress on the piping material and its joints. In combination with normal operating pressure, piping material, fittings, flanges and hangers can weaken with repetitive shock waves, potentially resulting in leaks and other costly issues. From pipe size to material choice, there are configurations you can design into your system to limit the impact of hydraulic shock and keep the total system pressure (normal operating pressure + hydraulic shock) within the design pressure of the system. Piping systems are designed to satisfy a specific flow rate and fluid pressure at critical junctions within an industrial application. If the pressure is too great or insufficient, operational issues can emerge leading to avoidable expenses. As part of this, industrial engineers must account for pressure loss (or pressure drop). Pressure loss is the result of frictional forces exerted on a fluid within a piping system, resisting its flow. As pressure loss increases, the energy required by system pumps to compensate also increases, leading to greater operating costs. Complicating things further, some of the factors affecting pressure loss can vary over the life of a piping system. In some cases, design considerations must be made up front to account for influences that won’t surface for five to ten years. So how can an industrial process truly optimize its piping system for pressure loss both now and over the life the system? The answer starts with understanding what influences pressure loss. By: Jorge Solorio Solvent cement is the recommended joining method for many industrial CPVC systems. These solutions use a combination of solvents and resin to fuse the polymer chains of two CPVC pieces. When solvents and resin are used to unbind and then fuse the molecules of any thermoplastic material, the newly formed joint needs time to dry and harden. This process is referred to as curing. If the system isn’t given time to fully cure, weak joints can cause issues within a system, specifically leaks. So, what does it mean for a CPVC schedule 40 or schedule 80 piping joint or CPVC duct joint to be fully cured, and how long does that process take? The Corzan® CPVC Building Information Modeling (BIM) objects and specifications library has been expanded. Previously, pipe and fittings were only available up to 8 in.—now find pipe sizes up to 24 in. and fittings up to 14 in. (fittings larger than 14 in. are currently fabricated, not injection molded). We expanded our CPVC pipe, fittings and valves library to enhance our support of industrial engineers, designers and architects. With access to these files, users can better: Detect and prevent design conflicts. Quickly create multiple designs to compare and identify the best value-engineered solution. Create detailed outputs for accurate cost estimates. Lower costs by reducing on-site errors and delays. Communicate clearly with non-technical investors and design makers. In virtually every industry today, manufacturers look for ways to make operations more cost effective. In the pulp and paper industry, this includes seeking new piping materials and methods that reduce costs while maintaining piping performance and satisfying processing requirements. The key objective is to find new or improved corrosion resistant materials that reduce overall costs and maintenance, while providing long-term service. To reduce costs and maintain lifecycle performance, paper and pulp mills are increasingly specifying piping systems made from Corzan® CPVC (chlorinated polyvinyl chloride). Read further to learn how this industrial thermoplastic delivers a high performing balance of properties that provide value to paper and pulp applications. In a field that's historically been led by metal, chlorinated polyvinylchloride (CPVC) is gaining tremendous traction as the piping material of choice for many industrial applications. This is thanks to CPVC's: Superior corrosion resistance High distortion temperature Pressure rating Ease of installation Lower life-cycle cost However, when considering CPVC piping, it’s important to note that not all CPVC material performs the same. Each manufacturer's CPVC compound is made with base resins that have different molecular weights and varying chlorine contents, as well as different compound additives that can affect compatibility and long-term performance. To ensure a provider's CPVC satisfies the demands of your industrial application, ask the following four questions. To simplify the process of integrating Corzan® CPVC pipe, fittings and valves into your industrial plant CAD designs, we’ve made our product Building Information Modeling (BIM) objects and specifications available for download. With access to these files, engineers and architects can now: Detect and prevent design conflicts. Quickly create multiple designs to compare and identify the best value-engineered solution. Create detailed outputs for accurate cost estimates. Lower costs by reducing on-site errors and delays. Communicate clearly with non-technical investors and design makers. For many industrial plants, metal piping systems have been the norm for decades, especially when corrosive chemicals, high heat and pressure are involved. However, quietly, chlorinated polyvinyl chloride (CPVC) has been usurping metal as the preferred industrial piping material thanks to its corrosion resistance, high heat distortion temperature, superior pressure rating, and low installation and life-cycle costs. If you’re new to CPVC piping for industrial applications, below we have answered some of the questions commonly asked by customers. The safety performance of industrial piping material cannot be overstated—these environments have hundreds, often thousands, of lives at stake, causing them to be closely monitored and regulated by government bodies such as the U.S. Occupational Safety and Health Administration and the Environmental Protective Agency (EPA). Add cost and reliability to the list of important factors when considering industrial piping choices, and it’s clear why material selection for process water applications is such an important one. Among the many piping choices in the industry, the superior strength, performance and safety of chlorinated polyvinyl chloride (CPVC) make it an ideal system for industrial process water applications. Traditionally, engineers and procurement professionals have relied largely on steel and other higher alloys for industrial piping. However, an overall analysis reveals that CPVC often outperforms metallic systems and is more cost effective over a longer period of time. Yielding an overall lower installation cost, fewer maintenance and safety concerns, and strong performance with a wide variety of chemicals, CPVC is a material that is gaining the attention of many. And the benefits don’t stop there. CPVC offers eight primary advantages that can, and have improved the bottom line of industrial process water applications worldwide. Water and wastewater infrastructure in the U.S. continues to deteriorate as its repair stays on the back burner due to economic uncertainty and lack of funds. To address costly repair issues, engineers and end users must think beyond what was good enough in the past and adopt innovative technologies that offer more economical installation, higher durability and reduced total life-cycle costs. Which Material Provides the Best Lifetime Value for Industrial Piping Applications? Savvy specifiers know that when selecting a piping system, it's not just the purchase price that matters when choosing a product that's designed for long-term performance. When evaluating an industrial piping system, this is certainly the case. The key to getting the best value from a piping system today, tomorrow and beyond typically requires a lifecycle cost analysis tailored to your specific plant. This analysis should reflect your plant's fluid temperatures, line pressures, and chemical environments, among other things. Delta® Faucet Company’s Greensburg, Ind., plant is the largest of its three faucet manufacturing sites, with 1,150 employees producing 1,500 different products. The engineers needed a piping material that could meet a variety of criteria: Corrosion resistance High-temperature resistance Resistance to acids and bases Meet stringent safety assurance standards Easy to modify and repair Taking each requirement into account, Delta engineers specified chlorinated polyvinyl chloride (CPVC) for its metal plating operations. Corzan CPVC, the Global Leader in industrial piping systems, has picked up its presence in Latin America industrial markets. Understand CPVC Piping Savvy specifiers know that cost is not the only factor dictating piping material selection. Those seeking long-term performance in Chemical Processing applications should also account for the demands and environment of the operation. Given the pressure, temperature, and medium, what cost-friendly option will provide the most durability? In this Chemical Processing Special Report, we delve deeper into: Chlorinated polyvinyl chloride (CPVC) piping and the significant benefits that alternative piping materials or designs may offer. Where CPVC piping fits in terms of cost and performance. Considerations for how CPVC may fit into industrial process water applications. Duration: 60 Minutes Power Plants create some of the greatest demands for piping systems. The chemicals used in water treatment are not only highly corrosive, but they are also often conveyed at elevated temperatures, subjecting metallic systems to corrosion, process leaks and premature failures that jeopardize plant efficiency, as well as safety and environmental compliance. Even the more expensive alloys, as well as lined carbon steel, are challenged to provide a cost-effective, reliable solution. The presenters will review a variety of thermoplastic piping system materials, with an emphasis on the polymer science of chlorinated polyvinyl chloride (CPVC), and how power plant operators are incorporating plastics to mitigate corrosion due to chemical attack on metals. Webinar Summary: Chemical processing plants create some of the greatest demands for piping systems. The chemicals used are not only highly corrosive, but they are also typically conveyed at high temperatures, subjecting metallic systems to corrosion, process leaks and premature failures that jeopardize plant efficiency, as well as safety and environmental compliance. Even the more expensive alloys, as well as lined carbon steel and such non-metallic alternatives as HDPE and FRP, are challenged to provide a cost-effective, reliable solution. The participants will review the polymer science of chlorinated polyvinyl chloride (CPVC) and how global CPI plant operators are incorporating the technology to mitigate corrosion due to chemical attack on metals. You will learn how to properly evaluate if CPVC has the right chemical resistance barrier to over 400 CPI common process chemicals. The brief discussion, will focus on how the vinyl technology such as CPVC fits into the solution matrix of CPI facilities. They will build upon the chemical backbone discussed in the first portion of the webinar and see how the science relates to real world solutions in common CPI applications such as hydrochloric acid, sulfuric acid, sodium cyanide, sodium sulfate, phosphoric acid, caustic, DI/RO water, brine, and simple applications such as potable water.